Club Penguin Cheats by Mimo777 Club Penguin Cheats by Mimo777: Gary Says Field Ops Will Return Later This Month! 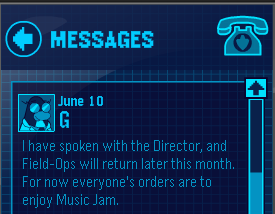 Gary the Gadget Guy has sent us Club Penguin message! ohh mimo, always you with the quips. I don't know why but I think G Billy is Gary The Gadget Guy because he has Gary's code name aca G and he is the smae colour. Remember that update on the login screen, its gone back to the old one. Is it just me or are the map, spy phone, and the mod icons missing? It might just be my penguin but, just checking. I gots some news for you!!! The new June Parent Update was sent and they give out a code that gives 500 coins to anyone who gets it! Mimo i think Club Penguin added new servers i think Sherbet is new ! Yay! I was getting really worried! Although I really do miss the missions! I hope they bring them back and SOON!